Tonight we are going to review a wine that is made of saperavi grapes. There are only a few single-varietal saperavi wines here in Moldova, as it is mostly used for blending with other international grape varieties, such as cabernet sauvignon and merlot. 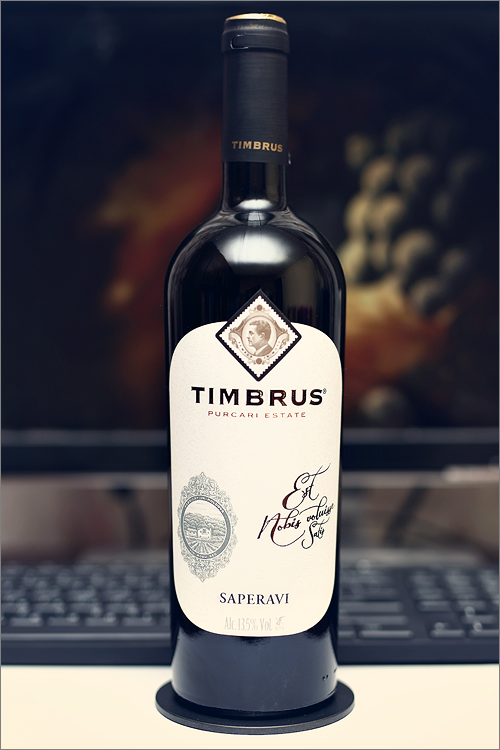 Still, this Georgian variety found its second home in Moldova, mostly due to geopolitical reasons in this part of Europe, and as a result, saperavi wines are quite popular here, and the wine we’ve picked for the review tonight is no different – Timbrus Saperavi 2014 from Bravo Wine. Deep and opaque garnet color, with some hints of purple towards the rim. The nose is rich, filled mostly with black fruit: sour cherry, leather, wolfberry, red plum, blue plum, wormwood, wildberry, black cherry and some hints of dried fig. An instant later comes secondary and tertiary notes of red pepper, roasted oakwood, cherry-tree wood, peonies and some subtle hints truffle. The wine is dry, with high alcohol level, high acidity and firm, maybe a bit green tannin. It tastes bitter-seedy, tannic and leathery, as this is a quite woody wine with some subtle earthy notes towards the end. The wine feels quite firm, but round and expressive at the same time. It has a fair overall balance and a nuanced astringency. The wine has a medium finish and a balanced, bitter-tart aftertaste. Conclusion: in our opinion this wine is still too young to drink now, as its acidity and tannins are yet to green at the moment. What it needs, is a couple more years of bottle ageing in order to settle down a bit and develop some complexity. Because of its nuanced earthy-leathery notes, we would recommend to pair this wine with grilled meat, like for example some grilled steak with pesto and crostini or a black & blushing worcestershire fillet, as the wine’s strong acidity and those fine-grained tannins will cut well through the charred-meaty flavours in the dish.